For the past several years, members of Chicago’s commercial real estate industry gather one evening to honor outstanding performance in office building management and shine a spotlight on the men and women who work on behalf of tremendous real estate assets. We’re referring to the annual BOMA/Chicago TOBY/Gold Circle Awards Gala. A view of the 2012-2013 TOBY/Gold Circle Award Gala from the south balcony in the Great Hall. 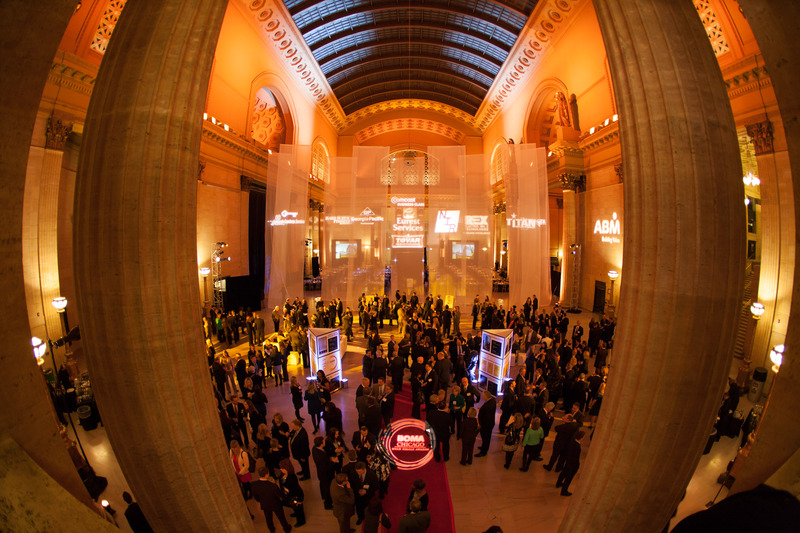 This dinner/awards presentation event, held the past three years in the Great Hall at Chicago’s Union Station, is our night to step out and recognize the true strength of BOMA/Chicago – the world-class properties and dedicated people who comprise this great organization. The 2013 Awards Gala was held January 31 and drew more than 480 members and guests, perhaps our biggest attendance ever for this event. It was a cold evening, but the mood and atmosphere inside the Great Hall was warm and encouraging. Ways to Spread the Word: We relied purely on digital communications to alert members about the event, but expected the news to spread organically. Our survey pointed out that 69 percent of respondents learned about the Gala through our website, e-newsletter or direct email messages. Still, 31 percent found out from a BOMA/Chicago colleague. The key takeaway is deliver your message digitally, and count on word-of-mouth marketing to help increase success. The Value of Video: To announce the TOBY (The Outstanding Building of the Year) and Gold Circle contestants, we developed a cost-effective five-minute video produced by our audio/visual contractor, Sound Investment. The video was played after some messages from the podium, and just before our emcee announced the start of dinner. The timing of the video helped keep the guests focused and made a natural segue to the dinner service. One guest offered this supporting comment: “I thought the flow of the event was the best ever. The video was much more entertaining than having someone read from a list.” Check out the video below, which was edited to include the winners. Stand by Your Sponsors: BOMA/Chicago relies on member sponsorships to help drive revenues that keep the event on budget. One objective was to make sure guests were aware of sponsorship support for the Gala. We used several tactics to build awareness for our sponsors, such as including sponsor logos on all electronic event promotional messages and onsite signage, projecting sponsor images on the walls of the Great Hall, and referencing them by name from the podium and in the PowerPoint presentation. We believe we were successful, because 81 percent of our survey respondents said they interacted with a sponsor and 24 respondents included text answers. Sponsors logos were prominently displayed throughout the TOBY/Gold Circle Awards Gala. Two other very important statistics from the 2013 event leads to the conclusion that guests enjoyed themselves: 99 percent of respondents indicated they were “very satisfied” or “somewhat satisfied” with the event, and 86 percent said they are “very likely” or “somewhat likely” to attend the 2014 event. So, I trust we’re doing most things right; but we’re always willing to learn ways to improve. Do you have thoughts about the 2013 TOBY/Gold Circle Awards Gala? Or can you offer ways we can improve our special events? This entry was posted in BOMA/Chicago Events and tagged 2013 Awards Gala, 2013 Gold Circle Awards, audio/visual contractor, audio/visual contractor Sound Investment, BOMA/Chicago, BOMA/Chicago colleague, BOMA/Chicago TOBY/GOld Circle Awards Gala, dedicated people, Great Hall at Chicago’s Union Station, members of Chicago’s commercial real estate industry, outstanding performance in office building management, Sound Investment, The Outstanding Building of the year, world-class properties. Bookmark the permalink. I was interested to see the video of the TOBY awards as described below, but the link does not seem to work. We’ve been looking for a company to make videos for our firm, and it would be very helpful to see what they created for you. If possible, could you please re-send the video link? This email and any files transmitted with it are confidential and intended solely for the use of the individual or entity to whom they are addressed. If you have received this email in error please notify the sender. Sorry the video didn’t work for you. I just checked and it’s working fine. You might have some setting that’s preventing the video from playing. I’ll also send this to you via email. Thanks very much and please reply with further questions. We sincerely appreciate your interest in BOMA/Chicago and The Elevator Speech.